If you haven’t used — much less heard of — Amazon’s TestDrive service, designed to let customers check out how an app works before buying it, you’re not alone. The company says it’s shutting the program down due to “a significant decline” in usage, among other factors. 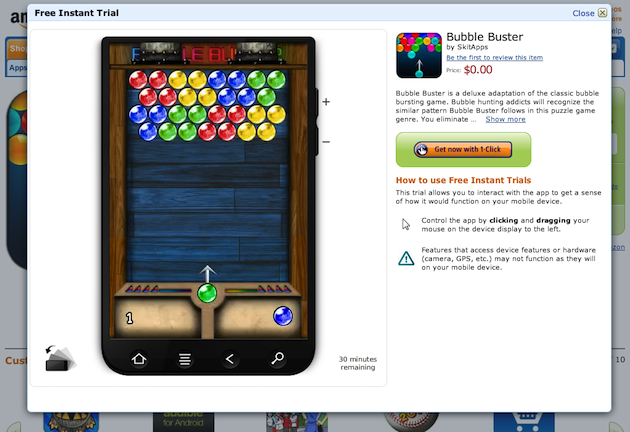 Launched in 2011, TestDrive let customers in the Amazon Appstore try out new applications using a browser-based simulation of Android, letting users control an app and see what it would be like to use on their Android device. The feature was also included on Android phones later as well, TechCrunch reports. Along with the fact that not enough people were using TestDrive, Amazon said the “free to play” business model also contributed to the feature’s shutdown — many popular apps are mobile games where publishers make their money through in-app purchases instead of relying on raking in cash through paid downloads. There’s no risk in “purchasing” a free app and not liking how it works, because well, you didn’t pay anything for it, so there’s no need to test it out beforehand if you can just delete it later without losing your money. It seems developers weren’t really jumping to be a part of TestDrive either, as Amazon’s site notes only 16,000 apps took advantage of the service — a number that stayed the same between 2012 and now. Which means many Amazon users could’ve just been bumping into a wall when the app they wanted to test drive wasn’t supported. Farewell, TestDrive, we hardly knew ye. No, really — we didn’t even know you existed.